The day has finally arrived, week four of our RE: series, the climax of the last four weeks. North Ridge is five years old today. Our celebration today touched on celebrating the last five years, but focused on how the next five years will look. We’ve aptly titled the last installment of our series, presented on our fifth anniversary and revealing our new location, Relaunch. Our celebration of the last five years was a little less than traditional. No pot luck meal, no grills stacked with hot dogs, no inflatable jumpy houses, not even a birthday banana pudding. To mark our five year accomplishment, we invited the top five organizations in our community we’ve worked alongside over the last half-decade. Each organization received a check from the celebration allotment of our budget, $1000 each. Diving into the message, the curtain was drawn away from the resolution to our building dilemma. Our current facility (the second location in our five-year span) comprises of three fairly small warehouse buildings we retro-fitted to meet our needs, very limited parking, and limited visibility to the general public. The worship building strains to contain us all on Sunday morning like a balloon ready to pop if it receives one more puff of helium. Our new facility is the shell of an abandoned grocery store, one two miles away from the current building. We’ll have 30,000 sq ft to do with as we please, and ample parking! This is a prime location next to the public middle and high schools in one of the communities we serve, across the street from the city’s Wal-Mart shopping center and less than a mile from the interstate for easy access. We have lift-off. With all the excitement the morning had already contained, one would easily fall into an internalized celebration of God’s goodness to us because of our faithfulness and lose focus of our responsibility with this new territory. Before commencing with “relaunching” North Ridge, Dean reviewed where we’ve come through the RE: series. God’s mission is to glorify himself. Our mission is to glorify God. The mission of the church is to make disciples. We train disciples by submitting ourselves and our mission to God individually and as a church body. God’s mission is not at odds with our joy, our joy is found in serving God. Through submitting our wills to God’s mission, the church unites and grows into and influential powerhouse of servant-hood, changing lives and communities. Through this unified body, God will flex and reveal himself. I ran with the concept of God flexing his muscles through the active church, putting a surreal spin on the image. 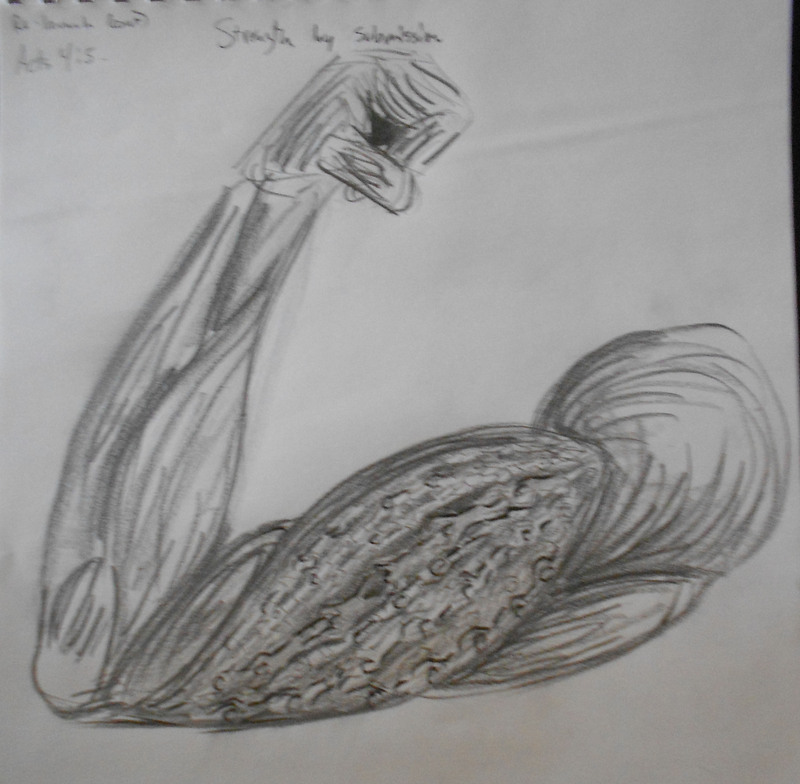 The drawing is the muscular system of an arm as it flexes its bicep. The muscles all look naturally anatomic, smooth and fibrous; all but the bicep itself. 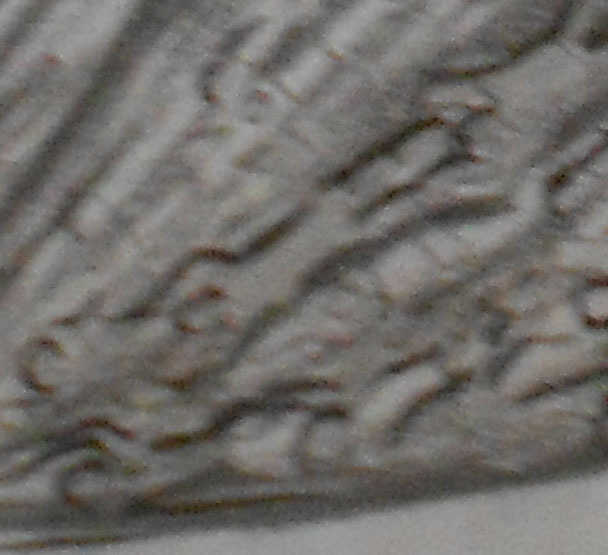 Upon closer inspection, small human figures com into focus. The muscle fibers of the bicep are human chains, each figure grasping the legs of the one in front of them. Muscles grow by flexing against added resistance over time. The muscle fibers expand and contract by submitting to the will of their person. By submitting ourselves to God (and to each other), we grow stronger as a unified body. Flexing together with the common mission of glorifying our Creator builds behind it a steamroller influence where, through us, God will change the cultural landscape of not only our community, but our world. North Ridge’s mission is simple, glorify God by serving people and growing disciples. Our new location will become more than a place we worship. Ridgewear (our member-run clothing and basic needs donation and distribution center) will continue impacting local families, The Dream Center will continue influencing and mentoring local students, new ministries will find themselves established and flourishing over the five years to come. North Ridge will be known not for how we worship, but how we serve. People will ask about our community involvement to learn that, oh yeah, people meet there to worship too.